The crater accompanied by a cliff can be found on the northwestern side to the south of the mountain, and the largest is called Kembang. A small lava dome occupies the top of a volcano. 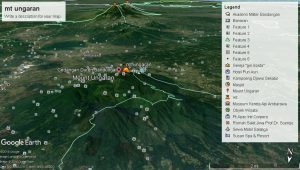 History of the eruption of Mount Sindara which has occurred mostly mild to moderate type (phreatic eruption). 1806: the eruption at the top of the mountain still doubted its truth. 1818: an ash eruption, spreading to the coast of Pekalongan, the moon is unknown (junghuhn, 1850, p.293). 1882: Ashes of ash in Mount Kembang. The ashes fall to Kebumen. Between 1-7 April may occur leleran lava on the northwestern slope. (Natuurk. Tijdschr, Nederl, Ind., 1884, v.43, p. 144-145). 1887: explosive sound on November 13-14 (Natuurk. Tijdschr.Nederl.ind., 1889, v. 48, p.201). 1903: 16-21 October, eruption in fracture times Prupuk above Flower between height 2850-2980 m. The ash rains reached Kejajar and Garung (van Bosse, 1913). 1906: September 22 – December 20, eruption at fracture S1 and the formation of K5 in the southern plains of sand Z1. On September 25th. ash rain in Kledung (Natuurk. Tijdschr Nederl. Ind., 1908, v.67, p.58). 1908: 10 February, there was a roar. (Natuurk. Tijdschr, Nedetl Ind., 1910, v.69, p.107). 1910: January, at Temanggung occasionally there was a roar (Natuurk Tijdschr, Nederl, Ind., 1908, v.67, p.58). 1970: After a break for 60 years there is again an increase in activity without producing an eruption. Hamidi and Hadian (June 1973), had climbed the summit, as did Reksowirogo, but did not appear to be the former eruption. According to Neumann van Padang (1951, p.112), Mount Sundoro is a very regular volcano cone, separated from Mount Sumbing by Pelana Kledung (1405 m). In the eastern part of the flat peak of 400 x 300 m there is a large K1 – K2 twin crater measuring 210 x 150 m, while the plains of Segero Wedi, Banjaran, Z3 and Z4, in the west and north, are the remains of the main and secondary craters. Cones and parasitic craters are found on the southwestern and northeast slopes and in the southeast foot. Several hundred hills on the northeast foot according to Taverne and van Bemmelen are the residual erosion of a landslide before the land before history or from lava. Volcanic rock sediment of Mount Sundoro is the result of central eruption, side and secondary sediment. The result of central eruption consists of lava, hot cloud / pyroclastic flow, pyroclastic fall and phreatic deposits, whereas side eruption results are generally lava flows, and the result of secondary process is lava.